Description: A new Electro-Motive, a Gevo and a 70 Mac followed as helpers. Description: Headed through BN Jct. shoving on a train headed down the BNSF Ft. Scott Sub. Description: NS 738's DPU rounds the curve at Cohutta. Description: Making really good time across the vast high plains and the Hi Line, BNSF 4410 drops downgrade into Chester, MT at track speed. Description: The swell of the plains engulfs everything, even the elevator and the approaching hotshot. Description: The 4410 West eases back approaching Shelby and a crew change. Description: Working DPU and showing off the lower than normal placement of the rear headlight. 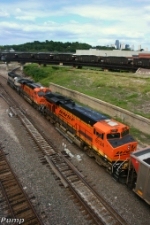 Description: BNSF 6124 leads this empty UCEX coal train north into Old Monroe, Mo. on the BNSF Hannibal Sub.